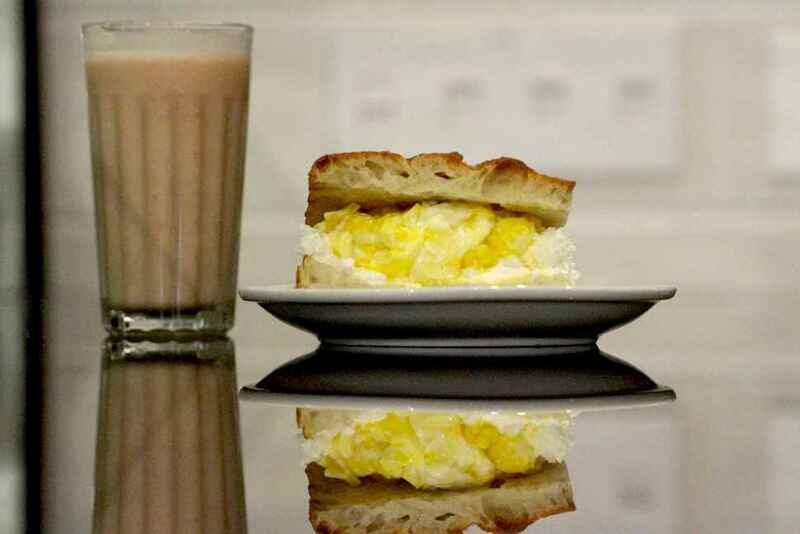 Breakfast comes in many different shapes and sizes, but the king of them all is the breakfast sandwich. It rules over the realm of morning meals, incorporating whatever ingredients it damn well pleases. The only bounds it knows are its book-ending slabs of carbohydrates. 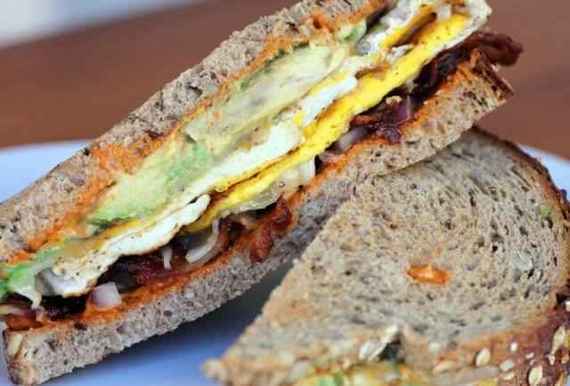 The breakfast sandwich is thus a powerful canvas for creativity (and bacon! ), but also a perfect vessel in which to deliver a concentrated combo of traditional AM ingredients (especially bacon!). To celebrate this great unifier of eggs, cheese, and other stuff, we've compiled a list of the 21 very best breakfast sandwiches in the country (not to be confused with our list of the best breakfast places in the country). You can thank us after your mid-morning nap. 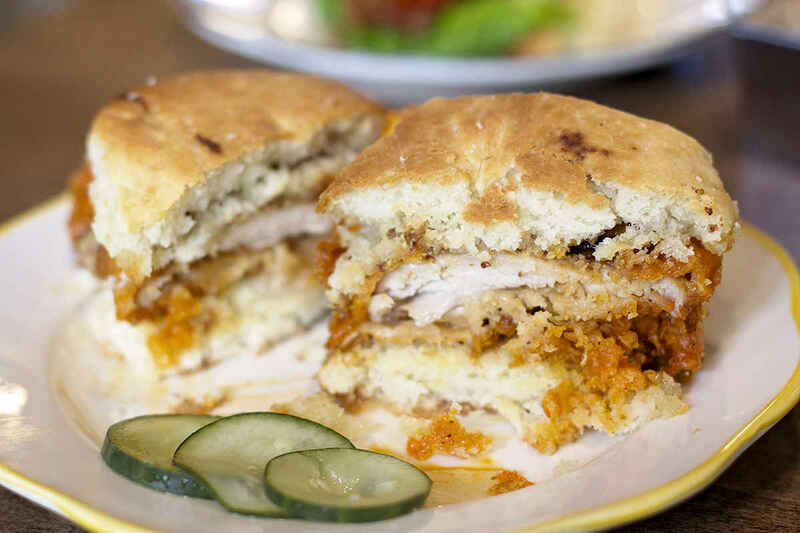 You can't go wrong with any of the sandwiches at beloved six-seat Boston institution Mike & Patty's, from the breakfast torta to the sa-té-sauced PBGC to the caramelized Banana OG on brioche (with Nutella!). But our advice is to go Fancy. Multigrain bread is the canvas, painted with two yolk-bulging fried eggs, cheddar, bacon, avocado, red onions, and just the right amount of house-made mayo. It's truly a work of art. New Yorkers still mourn the loss of the original Gramercy location of Ess-a, but the folks responsible for the city's thickest and fluffiest bagels are thankfully still pumping perfect bacon, egg, and cheeses out of their Midtown sequel. Perhaps the largest BEC in New York, this behemoth comes packed with a double layer of cheese (as all breakfast sandwiches should). Plus, you need not (and should not) toast the bagels -- they're always fresh out of the oven. Even if you go with sesame seed instead of everything, these bagels are everything. 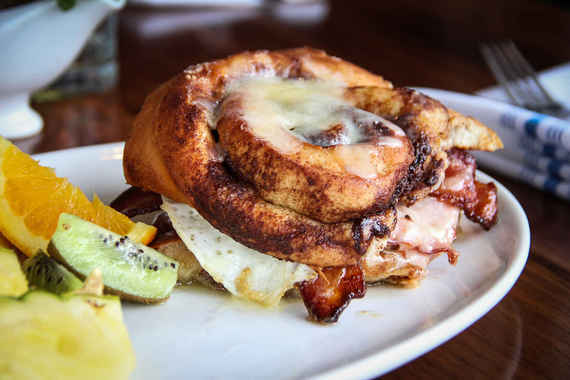 Look, we love the PDXWT with duck bologna at Portland Penny Diner and the wonderful breakfast sandwich at Bunk -- but our hearts, or what's left of them, belong to this Stumptown classic. The namesake biscuits don't stand a chance against a slab of fried chicken smothered in sausage gravy, smacked with melted cheese, and crowned with bacon and a runny egg. Is it excessive? Hell yes, it is. But this hangover isn't going to murder itself. The mobile mac daddies behind this Philly operation are currently pivoting from food truck to brick and mortar. So they might be hard to track down (check for them at some of the city's best events), but follow the macaroni trail and you'll be greatly rewarded with the most mutant sandwich on this list: an artery buster with hash browns as buns, a thick layer of homemade buttermilk ranch, and an egg-cellent alternative to huevos, their signature macaroni and cheese. 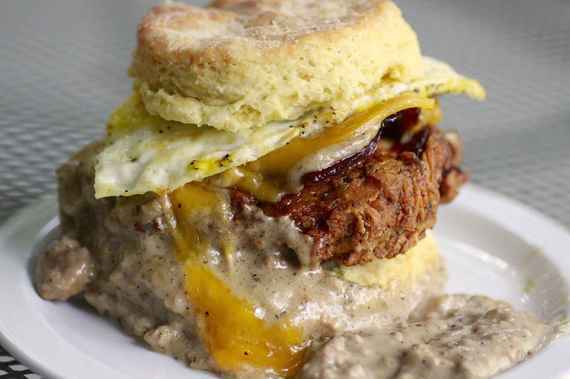 Tennessee is all about hot chicken, and if you're eating it in the AM, there's no better option than Biscuit Love. The Airstream operation became a farmers market institution, then went brick and mortar with a destination where hungry patrons flock to pay their respects to the Princess: a cayenne-crusted fried hunk of fowl on a thick biscuit made with flour from a nearby Kentucky watermill. The requisite pickles and mustard almost veer this into lunch territory, but a drizzle of sweetness in the form of warm honey makes it taste just like waking up. Picking one Garden State breakfast sandwich is a tall order. New Jersey prides itself on flying the flag of Taylor Ham, and although every corner dive will sling an excellent iteration (like G&S Deli in Newton or Tick Tock in Clifton), our in-house Jersey Girl swears by Frank's, a Bourdain-lauded beachside joint that takes salty slices of the state's signature meat and sandwichifies them to perfection. When your breakfast stop is a pie shop that bakes with leaf lard -- the highest grade of pork lard known to man -- you know you're in good hands. Bang Bang's small-batch sour cream biscuits are every bit as high quality as its slate of pies. 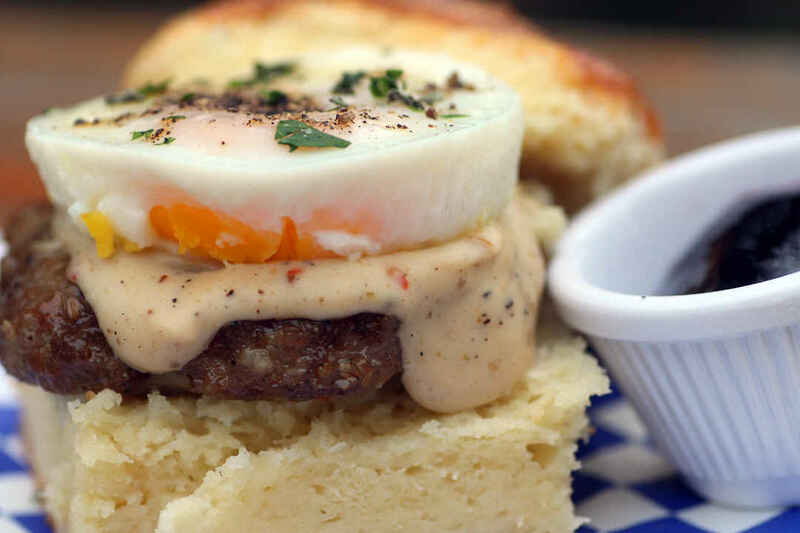 Your entry point is the far-from-basic sausage biscuit, which stacks soft-as-clouds biscuits with sage sausage, sawmill gravy, seasonal jelly, and a poached egg (which is a must-add). Located at the edge of Pike Place Market in the space that actually housed the original Starbucks, this seafoodery/raw bar from Tom Douglas isn't as famous as the super-chef's old-school spot, Etta's, but it deserves a serious rep for the fried egg breakfast sandwich alone. It starts with a buttery roll spread thick with avocado, then they add rich Beecher's cheese -- made just down the street -- and a heaping pile of rich Dungeness crab, making this a quintessential way to start the day in Seattle. Especially if you want your day to end, like, immediately afterward. J.J. Hapgood is the oldest continually running general store in the state of Vermont, and if Baby Boom taught us anything, it's that Vermont is full of general stores! That tidbit might make you think the provisions err towards the basic, but there's so much going on with their breakfast sandwich that they literally had to draw a diagram. Everything's local, from the eggs to the sausage to the bacon to the cheddar, and you best believe they don't skimp on produce like garden-fresh leafy greens. But the real star of the show is the homemade biscuit, which continues the homegrown theme by using flour, butter, and buttermilk all sourced in the Green Mountain State. Before tasting the Ship Biscuit at Saltie's, our NYC editor considered meatless breakfast sandwiches to be horrible abominations incapable of combating even the most amateurish of hangovers. But he ate his words, and a ton of these sandwiches, due to the magical way the creamy scrambled eggs mingle with soft ricotta on herb-crusted focaccia. It's one of the few breakfasts in New York City that doesn't need to fall back on bacon or a bagel, and for that we salute it. That's only half the list! 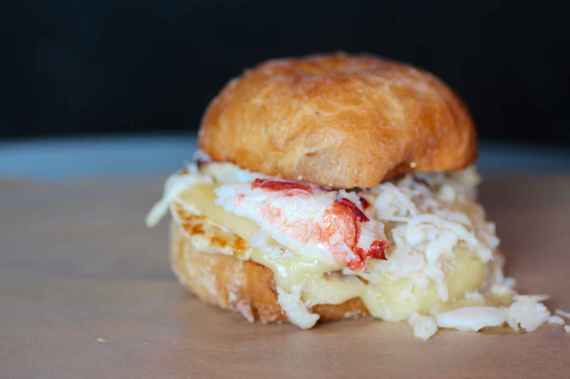 To find out which 10 other breakfast sandwiches round out the top 21, get the full story at Thrillist.com!